← My year of transformation: Day 1. New Series for 2015! Cheap Vegan. I am a member of many vegan facebook groups. One of the recurrent themes is about cost and grocery bills. After my daughter’s 16th birthday and Christmas, our own food budget was feeling a pinch. I have been feeding our family of 5 and sometimes 6 on about $10 a day . . . add in some staples and we are talking $100 a week. We are eating delicious foods. For the start of 2015, I am going to post at least one of our meals a day with a per portion cost. I will do portions because then you can see how many people it feeds. For example, if it is 4 portions, that means I made it for 4 people. Sometimes there are leftovers, and I will note that as well. Then I am going to do a What I eat in a day video once per week with the cost break down. I’m going to do that for all of January. I’ll start with a teaser meal from today. 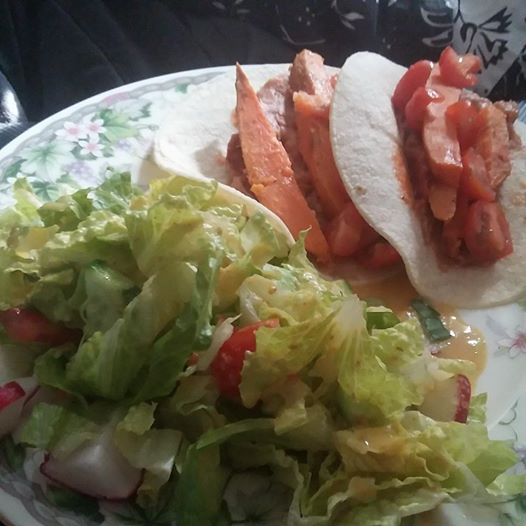 Today we had a delicious lunch that consisted of a salad (lettuce, tomato, cucumber, green onion, radishes) with Quick 6 salad dressing (homemade), two tacos with corn tortilla shells, refried beans, sweet potato, tomatoes, hot sauce. It was $1.11 per portion for 3 portions. You should totally eat this because it is delicious. And until tomorrow. . . Live, eat, and be well. P.S. Here is a link to the dressing. In our family, we use orange juice and half the miso.